The time has come and I can put it off no longer. Having built my new Y carriages I decided my desire to know if they worked out weighed the concern I had that they wouldn't work. As the job went along I started canabalizing parts off the old carriages to create new parts to mount the SuperPID and cable management system. If I was forced to return to the old carriages I was going to have a real problem. I am fortunate that I don't need to retreat but it bacame clear as the upgrade proceeded that all was going to be fine. The Carriage install took about 4 hours of labour with a vast majority of that being used in working out how to reinstall the SuperPID, Cable management and motor connectors. The old carriages were made of MDF so screwing peices onto the Y carriages was no problem. Not so when they are mad of Aluminum and steel. The upgrade was done over 2 days with the carriage install done on day 1 and the disassembly and cleaning of the X carriage done on day 2. The X carriage maintenance was long overdue and of course it required some TLC after being neglected for quite some time. Now it is reassembled and adjusted it is working better than ever. With the upgrader of the Y carriages comes a greater machining area on the table. The V-Bearings are spaced further apart than on the previous carriage by about 4 inches which is why I needed to lenghten the top Y rails but having added another 8 inches to the rail I now have an extra 4 inches of travel. I have also gained a few inches of travel in the X direction as well because the new Y carriages are narrower. Whether I retain this in future upgrade to the x axis will remain to be seen. Another Bonus is I was able to increase the Z travel so will be able to make larger projects. I have recently purchased an air cooled spindle and will be installing it in a future episode. I has not yet arrived but I am waiting as quickly as I can. 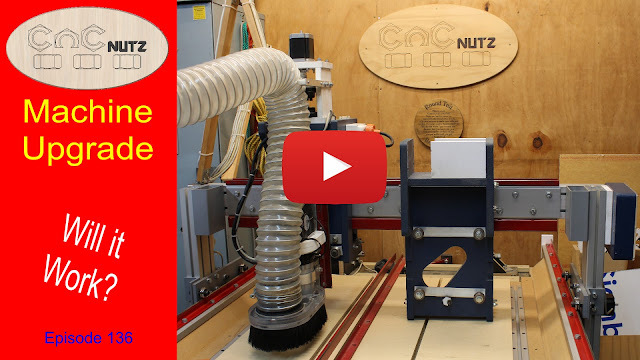 Stay tuned for more CNC madness.